As I mentioned, I was in Washington D.C. a few weeks ago with my g.f. We took the Vamoose bus lines round trip because they are cheap and they show movies. We had the best bus driver coming back. He showed In the Heat of the Night and The War of the Roses and gave wonderful introductions to both. Now a lot of people remember the t.v. show with Carol O’Connor– they don’t even know it was a movie first. I love to show this movie with the younger kids on board. Because there’s no cursing. You don’t hear one curse. Now some of you is married. So you gonna understand this movie. Some of you is probably thinking of getting married. Maybe this movie gonna make you think harder about that. 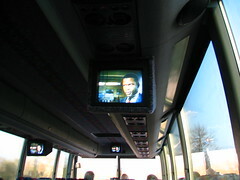 Compared to the movies we watched on the way down, Ocean’s Eleven and Sister Act 2, here were some classic movies that you just don’t expect to find yourself watching on a bus with a bunch of strangers. Yet they were perfect. As the light outside eked into darkness, Sidney Poitier confronted the darkness within a Southern town. And as the couples rested heads on each others shoulders, they napped off to Danny DeVito’s twisted allegory of love. Here was an unlikely environment for cinematic revelation, yet it was. I was reminded why I love movies. The stories opened up a confined bus into other worlds and united a group of strangers with a single hypnotic spell. It was magic. New York arrived all too soon.